I put on a new dress for church on Sunday, and was a little stunned when I turned around in the full-length mirror to check the back and saw my backside was a little bigger than I anticipated. I am blaming California Girl, because it was totally her idea that I do this blog. Because of this, I am cooking full meals more often–and of course, I have to “taste test” each of them before posting. I don’t refer to it as “taste testing” as much as I do “quality control.” It sounds much more professional, and indeed I want to make sure that the recipes I put on here to share are spectacular! Unfortunately, my rear end doesn’t know the difference between “quality control” and “taste testing” Oh well–it just means I have to do a low-calorie recipe this week, in an attempt to be a little conscious of fat and calories. 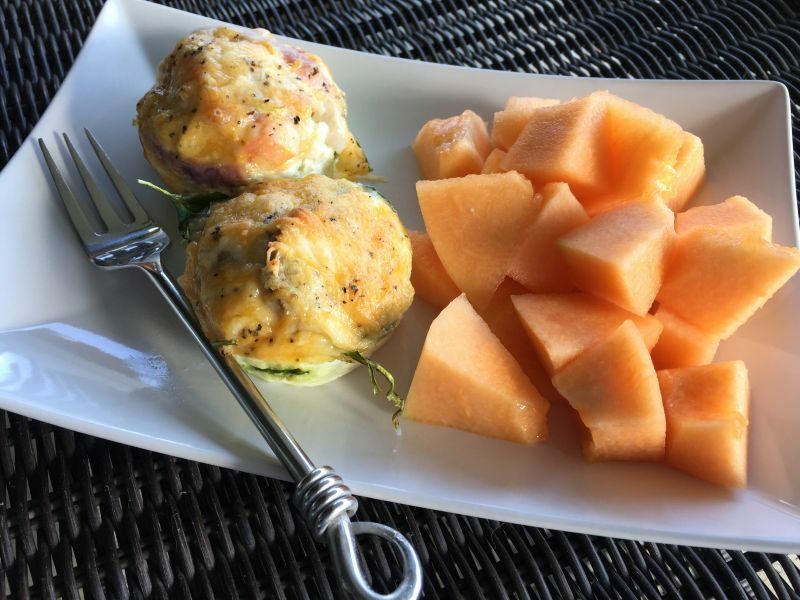 I decided to share several Mini Frittata variations with you. California Girl comments: Um yeh sure, blame me! It wouldn’t at all be all of the delicious baking you do for birthdays, to take to work, and every other non-occasion that you do…. 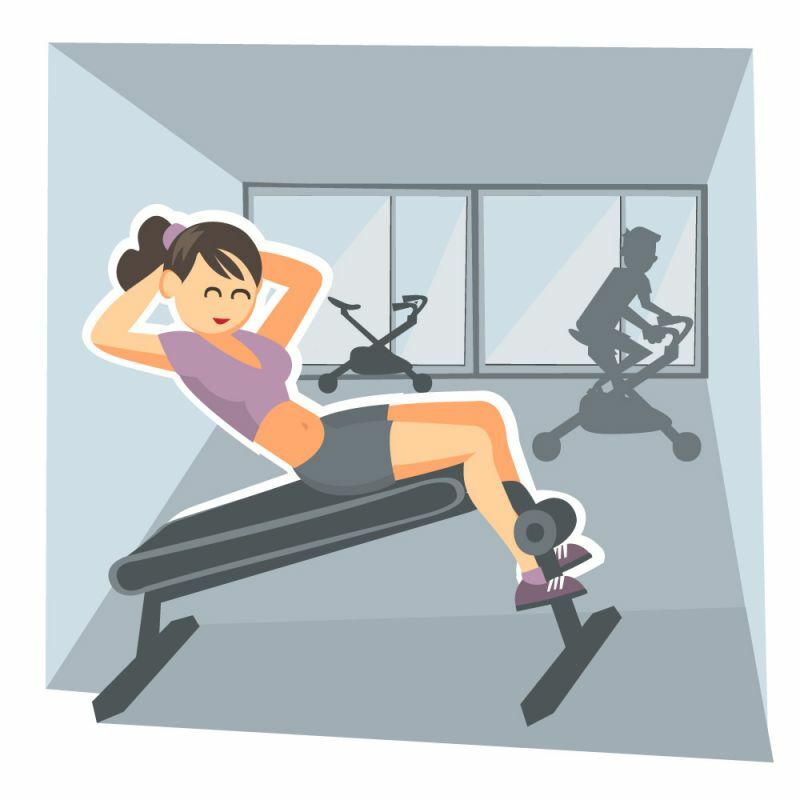 I’d suggest more cardio! It is no secret to my friends or family that I absolutely love to entertain. I don’t care if it is lunch, dinner or an overnight stay with a yummy breakfast in your pajamas. Because of this, I have to have some breakfast recipes that will look delicious and taste wonderful while at the same time being something different than what you might get at home. That means no pancakes or waffles. Anyone can do that. 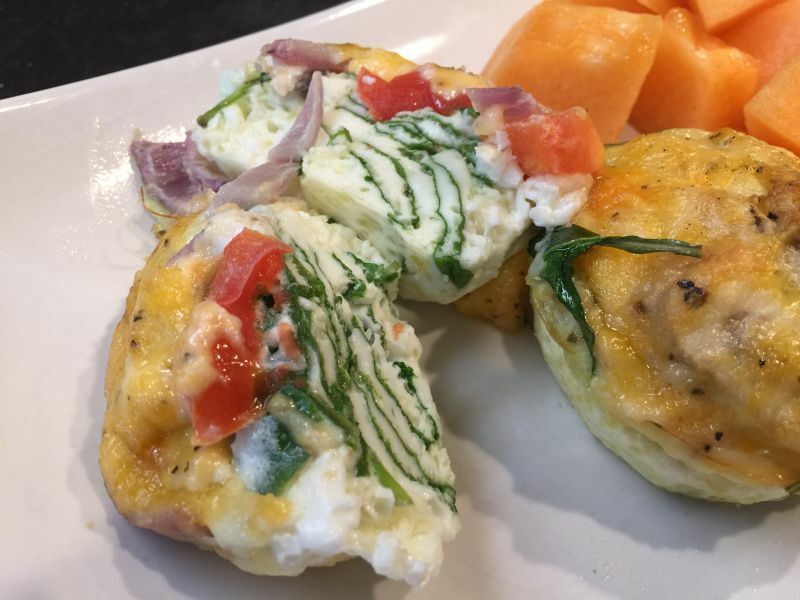 So here is a recipe for mini frittata’s that will impress your guests! These can even be served with a side of sliced fruit and a muffin as a treat for brunch! If you have ever had a frittata, you know it is simply a crust-less quiche. 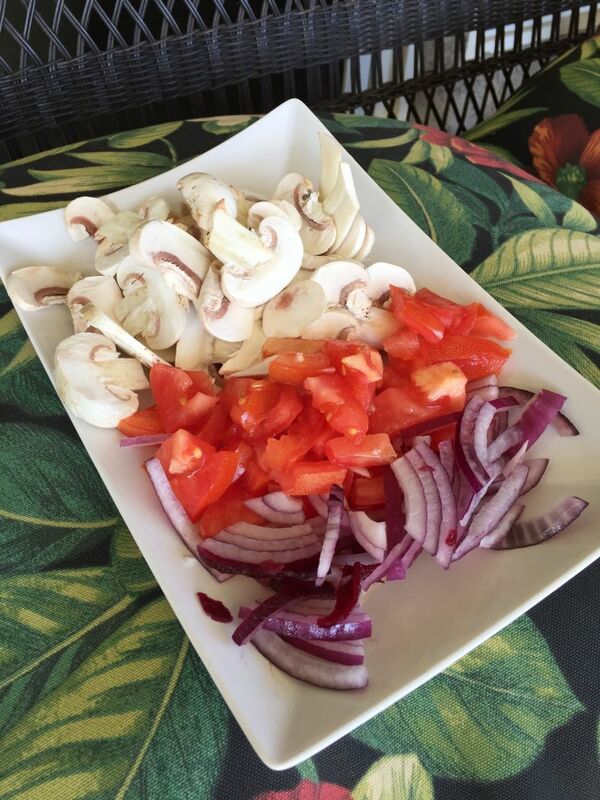 You can make a frittata with just about anything but it is traditionally made with assorted vegetables. My husband doesn’t like vegetables, so I make his with ham and cheese, or sausage, or sometimes with green chilies and chorizo. Because I wanted to make these low calorie and low fat, I am going to leave out the meat and make a couple of changes that will fit the bill. I discovered egg whites in the carton in the dairy case at the supermarket. They are easy, already prepared, and very low in calorie. 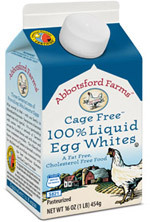 You can select the yellow “whole egg” version as well, but to keep it more low calorie I am using the egg white variety. One quart will make 12-15 frittatas. 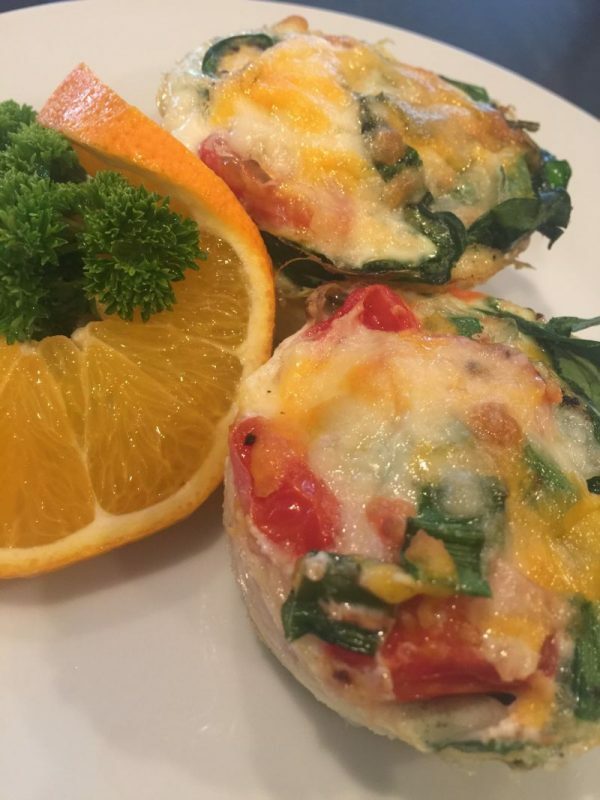 If you use vegetables for your mini frittata, each one made with the egg-white only option will be about 50 calories! How can you beat that? 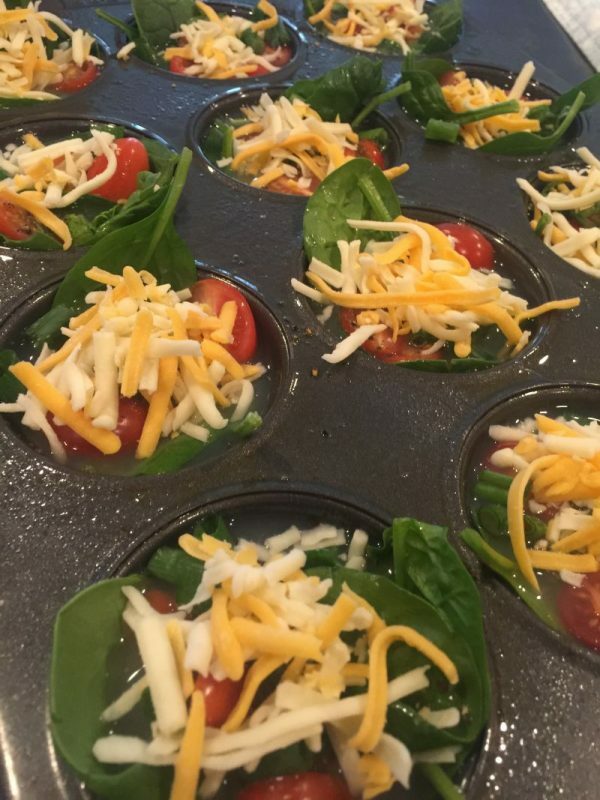 So for this recipe, you are going to need nonstick spray, diced assorted vegetables, baby spinach and grated cheese. If you choose to use meat in your mini frittata, precook it and cut into small pieces. 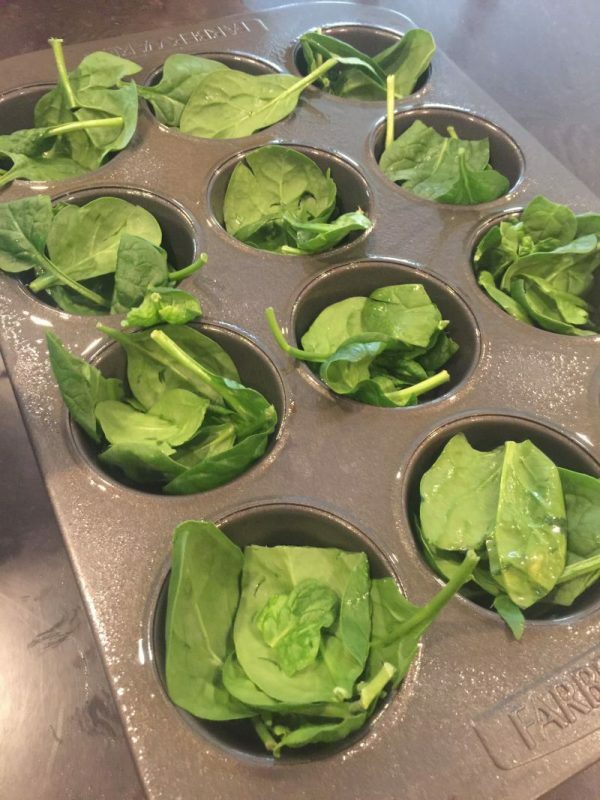 Fill the wells of the muffin tin about half full with the spinach leaves and then press the spinach leaves down a bit and curl the stems around so they aren’t sticking out. Now, add the vegetables you want into each well. You can make them all alike, or you can make them different. You can even have your family or guests select the vegetables they prefer, and make them to order! After adding the vegetables, put a sprinkle of salt and pepper on each one, and cover with about a tablespoon of grated cheese. The wells should be filled to the top at this point. Do not pack them down! Now just pour in the egg whites (or whole eggs) from the carton, over the top of the vegetables to fill each well. Place in the preheated oven and bake for 20 minutes, or until a knife put in the center comes out clean. The frittatas will puff up like a soufflé, and you will think you filled them too full, but once they set for a moment after you remove them from the oven, they will shrink down significantly. Use a rubber spatula, and run around the edge of each frittata, and remove from the muffin tin. Place on a pretty serving plate, and accompany with a side of bacon, fruit, or a bread choice. I make a dozen at a time for my husband and myself, and the extra’s go in a container in the refrigerator. One minute in the microwave on a saucer heats one perfectly, so leftovers are never wasted! They are a quick, delicious breakfast when I am in a hurry, so making a little extra is always worth it!